As you can see, I've been obsessing over tea cocktails lately. 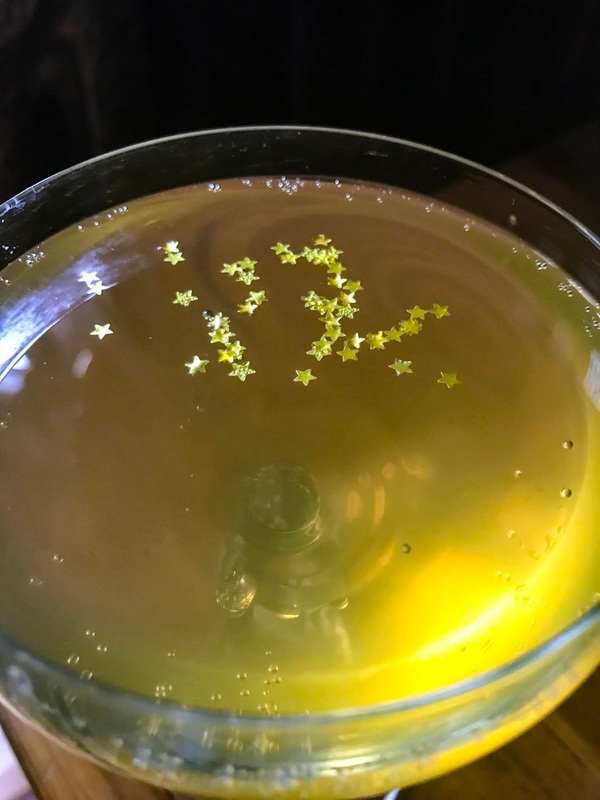 I love a festive cocktail, and holiday time is the perfect excuse to get creative. New Year's Eve is almost here, and I've been thinking about tea and champagne, as one does. 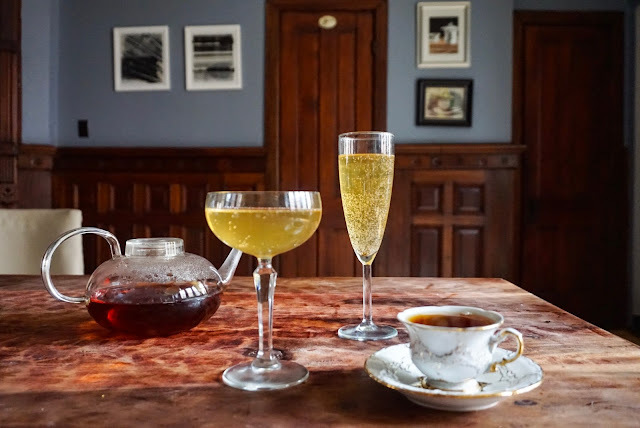 Wouldn't it feel glamorous to sip on a tea infused champagne cocktail while ringing in the new year? I was going back and forth about what type of tea to add to the champagne, and settled on earl grey. If you've read this blog for any amount of time, you'll know I'm not a fan of earl grey on its own, but I love adding it to things. In this cocktail it gives a bright citrus accent that works nicely with the fizzy wine. Earl grey is black tea with added bergamot flavor (either natural or otherwise). I was originally going to also add orange juice to this cocktail, to enhance the citrus kick from the tea. But I was thinking it should be a little bit more boozy, given the occasion. I decided cointreau would work nicely since it has a strong orange flavor. -If you are using loose leaf tea, I find it's easier to infuse the tea in a teapot, then strain the mixture into a pan to dissolve the sugar. -Any sparking wine will do here- champagne, cava, or prosecco, any bubbly wine with a similar flavor profile would work. -I use a homemade earl grey simple syrup for this cocktail (recipe below), but if you don't have time to make it, you could just steep up a cup of earl grey tea and add sugar to taste. But the earl grey simple syrup really adds a bit of extra flavor to this cocktail. -You can serve this cocktail in champagne flutes, and I also love old-fashioned coupe glasses, they give a little bit of extra style. -For garnish you could add a curl of orange or lemon peel. I love using edible gold stars, they are a fun way to add a little bit of bling to the situation. First, make the earl grey simple syrup: bring 1 cup water to a boil, turn off the heat and add 3 tbsp of earl grey tea, or three teabags. Allow to steep for 5-10 minutes and strain (I like to use a teapot for this step). Bring the tea back to a medium heat (you don't want to boil here) and add in the sugar. This may seem like a crazy amount of sugar, but trust me it works. Stir until completely dissolved. Allow this mixture to cool, and put it in the fridge until chilled. A couple of hours should do it. Assemble the cocktail: put two tbsp of chilled earl grey simple syrup in the bottom of your champagne glass, then add 1 tbsp of cointreau. Top with the sparkling wine. Garnish with a curl of lemon or orange peel if desired. Or for a little bit of sparkle, try adding a few edible gold stars. This cocktail is perfect for a New Year's Eve celebration, or even for weekend brunch. Why save the festive feeling for just a special occasion? It makes a great addition to sweet or savory brunch foods. And really, who doesn't love a little bit of bubbly now and again? Wishing you all a very Happy New Year! Thank you so much for reading the blog, and I look forward to a new, tea-filled year to come. I have lots new tea stories to share. Cheers! Oooh, just ordered the edible gold stars! I love tea cocktails--keep experimenting and sharing, please! Nice blogpost! I will put those tipps to good use!